Eli -- putting the Man in Manning. Well, I new it was just a matter of time before Peyton and the Colts would revert back to their old selves and Sunday proved to be that day. I listened to the game and watched the end of it and was shocked at the amount of people declaring that Peyton had a great day and the rest of the team basically let him down. Yeah, throwing two interceptions in scoring position is just what I call great. About as great as his receivers' stone hands. Did you see how many balls were flying out of the receivers' hands on Sunday? Looked like they were playing tetherball instead of football. I've seen kittens bat balls less. Then you have Joseph Addai rushing for a stunning 48 yards on the day. WOW! The story saturating all the sport networks is that the talk of Tony Dungy possible leaving the Colts caused them to implode. A professional team should not cave under high school drama type junk. "Boo-hoo; Tony's not taking us to the prom." Get over it guys, you choked like so many times before and for that you should apologize to your fans. You were the better team. But there was a great performance over the weekend from the Manning family. Eli led the Giants over the Cowboys at Texas Stadium. For the critics that say he's no Peyton Manning; I guess that's a good thing. He's a winner when it counted. Wins in the regular season are nice but it's all about the post-season; baby. The Giants' win means New York will face the Packers at Lambeau Field. The Frozen Tundra of Lambeau Field, I should say. Which is a good thing for the Pack. 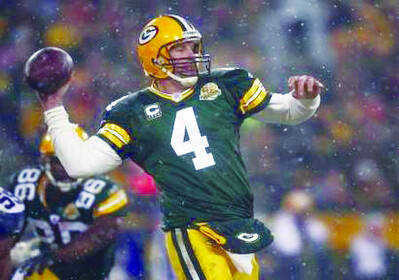 Favre has never defeated the Cowboys at Texas Stadium and now he will be in the comfy confines of sub-2o degree Lambeau; where he thrives. With the whole debacle in Dallas, I have but one thing to say -- thank you Jessica Simpson. The check is in the mail. Over the years, with the multitudes of players that have played in the NFL; there's one that has been atop my all-time hate list -- Rodney Harrison. I think he's been a dirty player throughout his career (opinion) but he was dethroned as of 4 p.m. Sunday. The newest half-wit that tops the list is Philip Rivers. Watching Rivers yelling at Jay Cutler during the Broncos/Chargers game was a little funny. Then after the game he says he was just playing. Fast-forward to Sunday and he's mouthing off to people in the stands as he was taken to the locker room to have his knee looked at and then again toward the conclusion of the game. It was kinda cute. Rivers turned completely around, jawing with people in the crowd like a little insecure child. "Look at me, my team's going to the AFC Championship game." Hey hotshot, look at the box score --Billy Volek led the team to the victory while you were on the sideline nursing your severe case of sissy-knee. Did you yell indiscriminately at your knee too? I looked up sissy-knee and known symptoms are child-like tantrums, pre-adolescent haircut and repetitive cases of whining. Sound familiar anyone? Reality -- I understand how Colts fans are feeling right now. My team sat out the playoffs for a few years. Just kick back and enjoy the rest of the season. Also, you should invite some of the Indianapolis players over for a Super Bowl party. They have nothing else to do -- be a good fan. Prediction Time -- Packers over the Giants 35-21 in the NFC Championship then Green Bay over the Patriots 28-24 for the title. If I'm wrong, Jernagan will eat his cheesehead. Shhh, don't tell Jared or you'll get in trouble. You used the word "cute" in a football article?! That goes against the unofficial rules of gridiron reporting. According to those rules on page 77, paragraph 7, subsection A & B, "the word 'cute' can only be put into a football related article under the following conditions: a) when referring to a female cheerleader; b) when referring to a pee wee player. "Cute" can never, ever, ever be used when referring a in high school, college or professional football. What are you talking about? "Cute" was obviously used in a mocking tone. To call Rivers cute is to demean him. That's quite all right. It's right up there with me calling Tom Brady a pretty boy, which he is. Just don't use cute in reference to any linemen or defensive players. They'll come to your house and hurt you. I'm not sure I understand the title of your post. Has the "man" in Manning been missing? Someone please explain to me how Jessica Simpson aided the Giants? Does anyone actually think that had Romo locked himself in the basement for two weeks the Cowboys would have won? Rivers is a brat. That much was obvious during the game, and I loved Dierdorf's comment. Wally, Brady may be a pretty boy, but he is still the best QB in the League. I'm definitely no Patriots fan, but you have to give the man his due. It is scary what he has done with the weapons he was given at WR. Weapons that Manning has had his entire career. I like Dungy, Manning, and the Colts better than their NE counterparts, but Brady is still the best QB in the League; pretty-boy or not.